I remember once reading about a Sunday School teacher who was trying to teach her children that we all need God's forgiveness. After sharing the Bible story, she asked one of the girls, "Lisa, when is a time you might need God's forgiveness?" The little girl's blank stare prompted a response from a little boy in the class. "It's okay, Lisa. You don't have to tell her," he said. Then he turned to the teacher and said, "We don't have to tell you our problems. This isn't the Oprah Winfrey Show." Well, I don't want to talk about my own problems either, but I will tell you that I've had to think a lot about forgiveness lately. If you are like me, sometimes it may come as a surprise to find that hiding in your own heart there is resentment and bitterness. After thinking much on the subject, I've realized forgiving someone can be one of the hardest things in life to do. The natural reaction is retaliation. We want the other person to hurt in some way just as we've been injured. We may even feel in a self-righteous way that our feelings of anger and desire to get back at someone are justified. But there are always odd results to wanting to get even. Thus, the Scriptures instruct us to overcome these negative emotions by bearing with each other and forgiving whatever grievances we may have against another. We must forgive even as the Lord has forgiven us. (Col. 3:13). In Matthew chapter 18 Jesus taught that we aren't allowed to hold a grudge. Jesus says even if we are the offended, we're not supposed to sit back and just wait for the offender to come to us first, we must care enough to initiate reconciliation (Mt. 18:15). Jesus also told Peter forgiveness must be granted "not up to seven times [which was considered magnanimous] but up to seventy times seven. (Mt. 18:22). Moreover, Jesus taught in this same chapter through a parable that there is a freedom that comes with forgiveness, but there is also a consequential torment and an estranged relationship with God when we refuse to forgive. Certainly no one ever modeled forgiveness like Jesus. After having been misunderstood by the masses, unjustly oppressed by the religious leaders of His day, forsaken by His own disciples, abused, beaten and crucified, Jesus implored, "Father forgive them, for they know not what they do" (Lk. 23:24). Earlier I wrote of children; let me mention another situation this time involving two little boys who were fighting as little boys are often prone to do. One of them yelled at the other, "I will never speak to you again." Afterward, they went to their respective homes, but the next day they were back playing as if nothing had happened. One of the little boys' mother asked why they were speaking to each other now. He responded, "Me and Johnny are good forgettors." Forgiveness can also require having a good "forgettory." But to forgive in the biblical sense doesn't necessarily mean we don't remember the trespass against us. In fact, if the offense is repeated and endangering, we may need to put some distance between ourselves and the offender. When the Lord says in passages of Scripture such as Hebrews 8:12 and 10:17, "I will remember their sins no more," it doesn't mean an all-knowing God doesn't recall our sins. Instead it means God chooses to never bring them up against us and removes our trespasses as far as the east is from the west (Ps. 103:12). It's true, however, over time we may forget all about the sin against us because we really granted someone forgiveness. But one thing is for certain, we haven't actually forgiven someone if we keep bringing up the past against them. 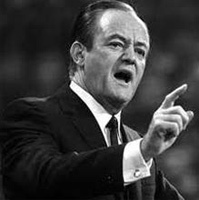 Regardless of what you may think of his politics, one of the most moving stories I ever heard was about Senator Hubert Humphrey, also known as the Happy Warrior of a few decades ago. Seated next to Hubert Humphrey's wife during his funeral was his long-time political adversary, already disgraced by Watergate, Richard M. Nixon. Humphrey, himself, had asked Nixon to have that seat of honor. Indeed, that's something I've done. Yet, I confess that I'm still a student of forgiveness, always challenged by the latest offense to forgive anew. In this life, there is no escape. Offenses will always come. But we either forgive, or we end up wallowing in our bitterness and self-pity like some unhappy guest on a perpetual and less than desirable episode of the Oprah Winfrey Show.